I know you must love a new restaurant review as they are some of my more popular posts. Aqua Kyoto isn’t technically new, but it’s new to me! clue what lies within the building! They have a fabulous cocktail list, cracking sushi and some of the best Japanese Wagyu beef dishes you’ll come across in Central London. I popped in this week for cocktails on the roof terrace and a leisurely dinner. This place is impressive as soon as you enter, it’s dark and mysterious décor gives the ambience of luxury so clearly, my kind of place! The bar, handily right near the entrance, served up some delicious cocktails that packed a real punch and we enjoyed sipping them on the outside terrace. This will be amazing in the summer but was still great in April, as they had heaters and blankets available. We kicked off dinner with salted edamame beans and soft shell crab tempura with lime pepper sauce. This was followed by some heavenly marinated wagyu beef and vegetable rice which was artfully cooked at the table, this was the highlight of the meal and I could eat this all day long, absolutely delicious. We followed that with wagyu beef bavette with soya garlic butter, egg tofu and namek which were beautifully cut morsels of buttery soft beef with a gorgeous sauce. We then finished off our savoury dishes with a platter of the Chef’s choice of sushi which was fresh and delicious. For dessert I went for the Japanese take on a classic French molten chocolate pudding which was instead made using black sesame and he had a very artistically designed delicate blow sugar apple filled with apple foam and tarte tatin with ice cream. 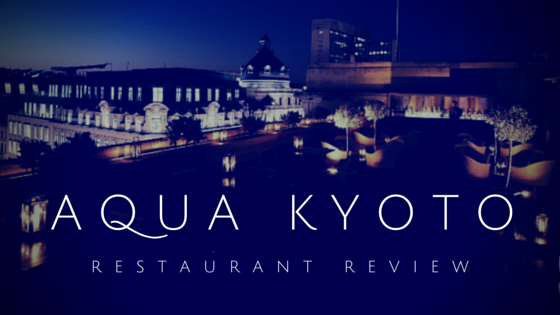 I will definitely be back at Aqua Kyoto, hopefully in the summer. They also have an infinity brunch option which includes unlimited Veuve champagne for two hours which sounds fabulous. It’s one hell of a place for a date or birthday or (like many we saw) for a business dinner, I definitely recommend that you check it out if you also love Japanese food.